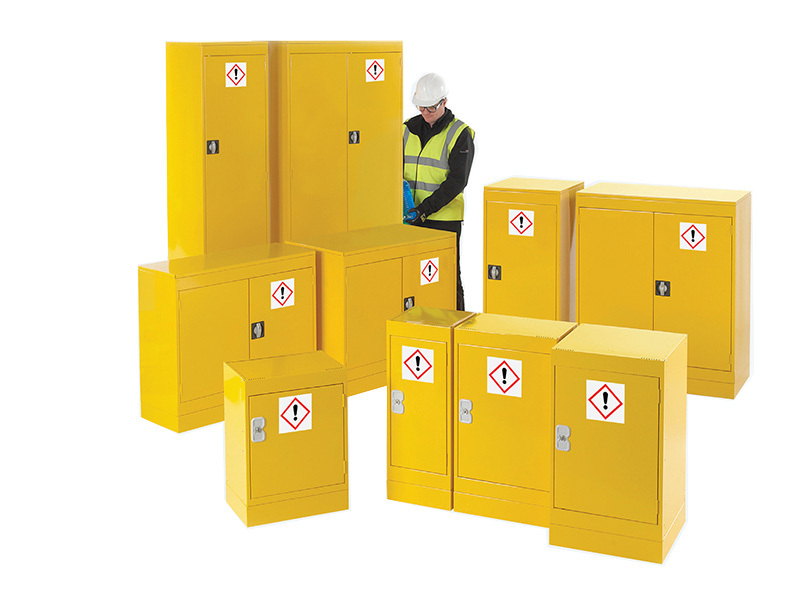 Appropriate safety labelling for COSHH storage cabinets raises awareness of the potential danger of the materials stored and makes location in the workplace easy. Full height door stiffener ensures additional strength and three-point locking gives additional security for our COSHH storage cupboards. For when you have lots of hazardous materials, and need to store them properly, Hazardous Storage Cupboards are just what you need. 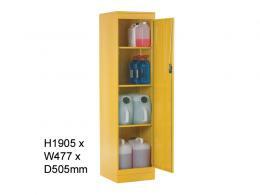 With a variety of sizes and capacities, these are the cupboards to store all of your hazardous materials in. 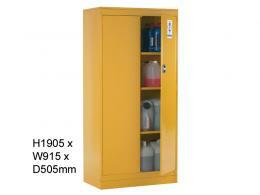 Powder coated bright yellow paint makes this chemical storage cabinet highly visible. The included safety labels help to customise your cupboard to meet your hazardous material storage needs. Units 770mm and smaller come with flush fitting handle and camlock. Units over 790mm have three point locking systems. What is the Purpose of the Hazardous Storage Cupboards? 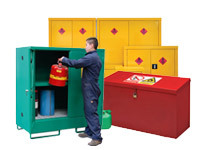 These safety cabinets are designed to hold and contain materials deemed hazardous. The hazardous material labels and bright yellow paint help to make these cupboards highly visible. The fully welded integral sump helps to contain any materials that might leak or fall from their container in the chemical storage cupboard. Where Can This Chemical Cupboard be Used? This chemical cabinet can, and should, be used in any environment that contains hazardous materials that must be securely stored. These types of work environments can include: janitorial/custodial, auto mechanic, construction, laboratory, and many more. Who Might Use This COSHH Store? This chemical cabinet might be used by anyone who owns, operates, or works at a place that uses or owns hazardous materials. This might include, but is not limited to: car mechanics, janitorial staff, construction teams, or factories. There are 11 different varieties of Hazardous Storage Cupboards. They range in size from 595(H) x 450(W) x 300(D) to 1905(H) x 915(W) x 505(D). All include four hazardous material stickers. The smallest cupboards do not have shelving other than the sump. The largest cupboards have three adjustable shelves. All cupboards are protected by a standard 1-year parts/labour warranty. In case of spills within the cupboard, it is recommended that the sump is emptied in accordance with waste management regulations.